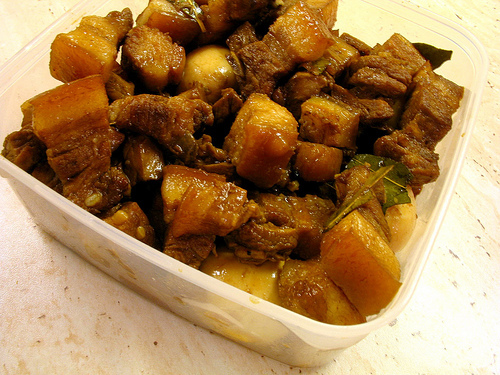 Pork adobo is the national dish of the Philippines, and the best pork stew in the world! There are many variations of this dish within the Philippines, but the basics are the same. I ate a version in Solvec Cove in Luzon which had dwarf bananas in it. You can also add pineapple chunks to this dish if you so wish. I use a pressure cooker to get the meat really tender and succulent. The addition of vinegar helps to render off the fat and add a tangy succulence to the meat which defies description – you just have to try this! Skin and cut the meat into bite sized cubes, cut any bones into separate pieces and add to the mix. Heat a little oil in a wok until smoking and add the meat to brown. Drain and transfer the meat to your pressure cooker. Add the vinegar, soy sauce, garlic, sugar, stock and plenty of black pepper and pressure cook for about 45-50 minutes. Drain the stock through a sieve into a collecting jug/bowl and stand for 3 minutes to allow the fat to rise. Skim off the excess fat and return the skimmed liquor to the meat. Add the cornflour and heat until the sauce glazes and thickens, then serve. Serve over plain steamed rice, with a single steamed green vegetable on the side. I like to use broccoli or whole green beans. Always make more than you think you will need, it will all be eaten!